Usually, we have our weekly campfire on Wednesday evening. We cookout our burgers and dogs, grab our letters home, and file down to the waterfront for a fun evening of songs, skits, jokes and challenges. This Friday, though, we had a very special and very different campfire: Cabin Unity. Cabin Unity campfire is an annual tradition at Woodland, and it is a time for cabins to join together, focus on each member’s strengths, and bond as one group. It’s always a memorable and moving time, and it marks a point in the summer where the girls really “clique” together within the cabin. 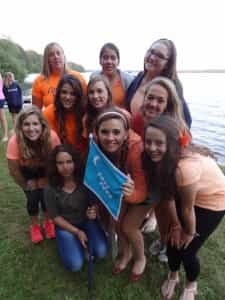 This year, Cabin Unity was hosted by the girls of Hilltop, and they started the festivities at morning assembly by assigning each cabin a color to dress in for campfire. At Rest Hour the plans continued, as each cabin composed their “cabin pledges” on sheets of birch bark. These pledges spell out the promises that the girls of the cabin make to each other, about respect, kindness, enthusiasm and cooperation. Finally, that evening, the cabins walk down to campfire, dressed all in the same color and ready to bond! Hilltop organized several bonding games, including a Compliment Circle (in which every girl both gives and receives a compliment to and from another girl in the group), the Machine Game (in which the whole cabin works together to silently represent a machine), and name games. Hilltop led us in singing “Make New Friends, But Keep the Old” – a camp favorite! We closed as usual with our friendship circle, and it was extra special after our evening of connection and community building. Thanks for hosting us, Hilltop!